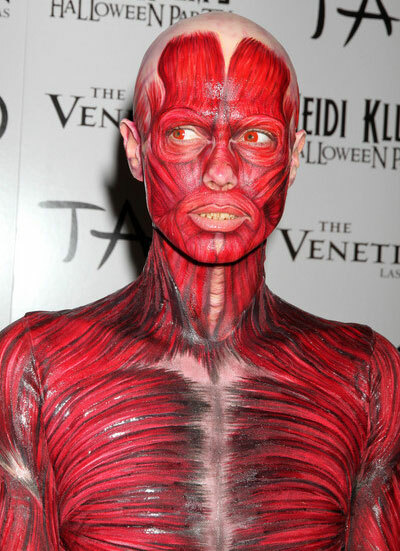 Heidi Klum is not ashamed to take off everything for Halloween – including her skin! The Project Runway host is a recognized Halloween fan, and she takes her festive appearances seriously… Maybe too seriously this time. She had expected that she would attend a lot of Halloween parties this year, and had a pretty gory idea for her 13th, an eponymous one that was thrown in Las Vegas on Saturday at Tao at The Venetian. Intending to scare like there’s no tomorrow, the 38-year-old supermodel appeared on the red carpet unrecognizable as a skinless torso complete with blood-hued contact lenses, yellowish prosthetic fangs and a bald head cap. Having stepped onto the carpet (in platform heels) in the company of two doctors in bloodstained overalls, Klum made to topple and pass out on a handy gurney. After her dramatic entrance the supermodel shared with reporters that she had been cherishing the skinless appearance idea ever since July. She secured the assistance of Martin Izquierdo, one of the designers for Victoria’s Secret shows. He provided the design and painted out the costume himself. Us Weekly relates the story of the suit that started out as a tight-fitting white affair and required accurate hand-painting. The supermodel said that Izquierdo actually painted the muscles and tendons from anatomical photos of a human body. At least donning the gory thing on wasn’t difficult – the bodysuit came with a zipper on the back. Yet there was the final stage of preparation that took a considerably longer time. Klum had makeup artists working on her face and body for something like three hours and a half. But Seal’s wife thought it was worth it and not so troublesome after all. “I’ve been body-painted for 12 hours, so three-and-a-half hours is not that bad,” the supermodel commented. Klum and Seal’s four children – who love the holiday as much as their mother does and are ready to sport their getups – were precluded from the overboard sight of their mother with her skin off. Monday’s party at the PH-D at the Dream Downtown in New York will see Klum in yet another costume. Source of the image: Jurubd, Starpulse.